Like their Florida counterparts, the Orlando Magic have accomplished quite a bit in their 22-year NBA life: four distinct superstars, a pair of draft lottery wins, two Finals trips. This team’s done it all- except for winning it all. But the thing is, for as great as Shaq, Penny Hardaway, Tracy McGrady and Dwight Howard have been, what’s most responsible for making the Magic memorable is the NBA on NBC. I remember Sunday mornings in the early 1990s. 10 am Pacific time. As Meet the Press wound down, John Tesh’s “Roundball Rock” would play. I’d start getting pumped for the week’s showcase Eastern Conference game. We were getting either the Bulls or the Magic. Michael or Shaq. But it was more than that. I wanted the Magic at home. That was the best. The great pinstriped home jerseys. The (back then) awesome home crowd. The black-and-blue key on the parquet floor at the O-rena. I was never a Magic fan, but that was a pretty awesome viewing experience. The team’s had its highs and lows in the intervening years: reaching the 1995 Finals; getting swept out of the 1995 Finals; Shaq leaving town; Penny Hardaway’s injuries; T-Mac at his brilliant best; 200 games from Grant Hill over six seasons; Stevie Franchise; Steve Get The Hell Away From Out Frachise; Dwight Howard slipping to the #2 in the draft; reaching the 2009 Finals; getting bounced in five games. A lot’s changed in the past decade in a half. Shaq’s having a tough time finding work, Grant Hill is healthier and better than Tracy McGrady, I’m in my 30s and the early game now starts at 1:00 pm for me, and it’s now on ABC, not NBC. But you now what? The Orlando Magic, led by a fun-loving big man, are still a staple of that early Sunday game. The pinstripes and the awesome crowds are gone, but it’s close enough. Remember how awesome this guy used to be? “Penny” came out of Memphis drawing comparisons to Magic Johnson and even had the “next Jordan” tag applied to him for about a minute. Thing is, while he was never MJ, when healthy, Penny was actually developing into a nearly unstoppable Magic-Pippen hybrid. His early years were spent alongside Shaq, with whom he formed one of the most devastating duos in recent memory. The pair was frequently referred to as a young Magic & Kareem, but proved to have neither the longevity nor the success of the Lakers’ famed duo. After an outstanding rookie season (16 ppg, 5.4 rpg, 6.6 apg), Hardaway made a leap as a sophomore, and over the next three seasons averaged no less than 20.5 ppg, 4.3 rpg and 5.4 apg. During that stretch, he was selected to three consecutive All-Star teams and two consecutive All-NBA 1st Teams. Hardaway was actually selected to a fourth straight All-Star team, and fourth as a starter, in 1997-98, but this was exclusively on popularity, as he only suited in 19 games that season. In just his second season, Hardaway was a bona fide star and starting at the point in the NBA Finals. And while no one in Orlando was happy about a Finals sweep at the hands of the Rockets, it was hardly the end of the world since the Magic were certainly a budding dynasty. What no one knew at the time was that the moment before the first of Nick Anderson’s Game 1 free throws would be the highwater mark for the 1990s Magic. Never again would things be that good for that group. Sure, the next year would bring 60 regular season wins, but in the postseason the Magic fell a step shy of 1995, falling to Jordan’s 1996 title team. The next season, Shaq’s last in Orlando, would end with 45 wins and a Round 1 playoff exit. And while another brilliant individual season from Penny Hardaway followed in 1996-97, the magic of the mid-1990s had seeped out of Orlando. Jameer Nelson joins Penny in the category Finals PGs for the Magic, and looks well on his way to teaming with Dwight Howard to trump the achievements of the 1990s. But he’s not quite there yet. And while he will also probably accumulate the stats to surpass Penny, his stats (12.4 ppg, 3 rpg, 4.6 apg in 394 games) aren’t there yet either. And while Steve Francis’ stats (19.4- 5.4- 6.5 in 124 games) are actually superior to Hardway’s. However, his season-and-a-half tenure with a pair of sub-.500 teams, before being suspended for conduct detrimental to the team and subsequently traded to Knicks, removed him from consideration. Nick Anderson is the Bill Buckner of the NBA. While that may be a bit of an overstatement, it’s not totally off base. This is a case of a good-to-very-good player, and by all accounts a really good guy, having the accomplishments of a long and productive career overshadowed by his worst on-court moment. 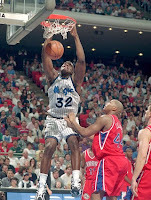 Nick Anderson was a member of the Magic from Day 1, and a mainstay in the lineup for a decade. For ten straight years, Anderson scored in double-figures for the Magic, seven times averaging at least 14.7 ppg, with a pair of 19.9 ppg, 6+ rpg seasons. Anderson was Orlando’s best player before the arrival of Shaq and Penny, and was there through the tenure of both. He’s the only Magic player to score 10,000 points and remains the franchise leader in points, games played, minutes, field goals attempted, field goals made and steals. He’s also second in defensive rebounds (288 more than Shaq!) and third total rebounds, behind only Dwight Howard and Shaq. Penny was the franchise’s first truly spectacular perimeter play. Mike Miller won a Rookie of the Year award as a Magic SG. Jameer Nelson, like Hardaway, has been an All-Star and helped lead the Magic to the Finals. As good as they all were (or in Nelson’s case, are), no backcourt player personifies the Orlando Magic franchise more than Nick Anderson. 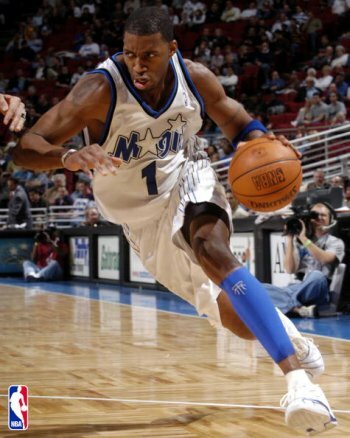 Tracy McGrady is Orlando’s best-ever all-around player, and its first “Post-Shaq” star. He wasn’t meant to fly solo, but s a role he was thrust into. 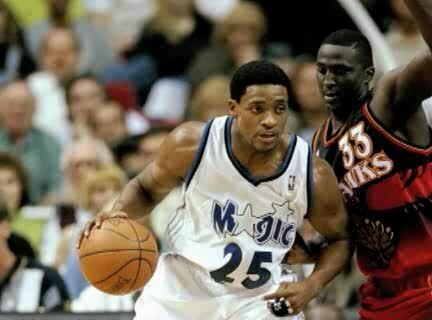 After the departure of Shaq and Penny, McGrady arrived as one half of a big-ticket free agent duo, along with Grant Hill. Wasn’t quite LeBron and D-Wade hooking up in South Beach, but it wasn’t too far off. 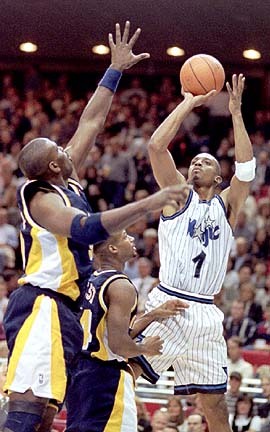 But with Hill hurt for virtually his entire time in Orlando, T-Mac was forced to become a solo act. And man, was he great! Based on his four seasons in Orlando- during which T-Mac was an All-Star four times, made All-NBA 1st Team twice, All-NBA 2nd Team twice and won back-to-back scoring titles in 2003 and 2004- it was almost impossible to imagine a scenario where he wouldn’t go down as one of the NBA’s best ever. Then, for reasons that remain unclear, The Magic traded McGrady,at the peak of his powers, to Houston in a seven-player deal that included Steve Francis (remember, he was a stud back then) and Cuttino Mobely. While this choice wasn’t tough, the next tier after McGrady is awfully stacked. Dennis Scott, Hedo Turkoglu, the aforementioned, injury-plagued Grant Hill and Rashard Lewis rounding out a very strong group of SFs- doubly impressive considering the franchise has only been around for 22 years. Funny thing about this last group is the fact that Rashard Lewis is so much more comparable to D-Scott, Hedo and Grant Hill than he is to Tracy McGrady. Good thing they’re not paying him something crazy, like $22 million per year. The best postseason PF of the 1990s. Grant was brought to Orlando to assume a familiar role. To help a pair of superstars- in this case Shaq and Penny- over the championship hump. Hit the glass, pick and pop, hit the 18-footer. Maybe Orlando didn’t manage to capture the ultimate prize, but Shaq-Penny-HoGrant did make a Finals run, marching through the team that was content to let Grant walk away- and a slightly rusty #45- in the process. 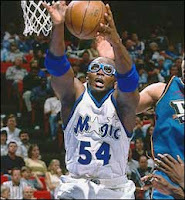 In six seasons with the Magic, Horace Grant was who we thought he was. A hard-working, rock solid professional. While this was a one-horse race, it was interesting to discover that statistically, Terry Catledge’s (huh?) numbers compared very favorably to Grant’s. As the Magic PF in their first four seasons, Catledge averaged 15.3 ppg, 6.8 rpg in 224 games. Shaq made the Magic relevant and gave the franchise its first superstar. It’s easy to forget that Shaq spent just four seasons in Orlando before heading to L.A.
Shaq entered the NBA with as much hype as any player in memory and quickly developed into most physically dominant big man since Wilt Chamberlain. Shaq was the rare can’t-miss college superstar that not only doesn’t miss, but truly delivers in the NBA. In four years with the Magic, Shaq was an All-Star four times, Rookie of the Year in 1993, scoring champ in 1995 and the catalyst for Orlando’s 1995 Finals run. Man it feels wrong bumping Dwight Howard (17.5 ppg, 57.5% FG, 12.7 rpg, 2.1 bpg in 489 games) to second place, but he’s got a bit more work to do. Howard matches Shaq’s four All-Star selections and NBA Finals trip (Howard even got a win). To top it off Howard’s got a pair of All-NBA 1st Teams selections. Shaq was an absolute monster in the paint- and more skilled. When his offensive game develops- and I still believe that it will, though my faith is waning- Dwight Howard will be completely unstoppable. Hell, even if he just keeps doing what he’s been doing, this position likely plays out differently a year from today. By the way, Rony Seikaly (16.4- 8.7 in 121 games) was really good with the Magic too.